When it comes to maintaining the bacterial ecosystem in your septic system, it’s important to keep a close eye on the household cleaners, especially those that promise to kill bacteria, you use around your home. Septic systems can withstand moderate use of some chemical cleaning products, but using too many, or the wrong kind, will throw off the balance in your septic tank and lead to problems like clogging, groundwater pollution, and leach field failure. Moderate use of the proper kind of household cleaners will not only be better for your septic system, but also better for your family as well. 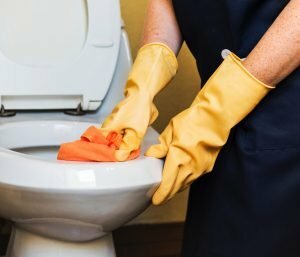 Which Household Cleaners are Safe for my Septic System? One good indication that a household cleaner is safe for your septic system is if its label clearly indicates it is “septic safe” or “septic friendly.” However, products with these labels are sometimes difficult to find. Such products are often labeled as biodegradable, phosphate-free, and environmentally friendly. A good bet is to opt for products that contain active ingredients that are bio-based or natural, rather than those with chemicals as the primary active ingredient. Citrus, vegetable, pine oil and seed-based cleaners – like those in the Mrs. Meyer’s product line – will still clean your home without upsetting the bacterial balance in your septic tank. Almost any cleaner that is water-based, like water-based bathroom cleaners, disinfectants, and carpet cleaners, will be safe for septic use. Any water-based household cleaner will list water as its first ingredient and will not contain harsh solvents (which are often acid-based) that will damage the ecosystem in your septic tank. Which Household Cleaners Should I Avoid Using in My Septic System? Bleach, in diluted moderation, is safe for septic use. When used as directed, bleach will keep the inside of your home clean while not killing off the bacteria in your septic system. However, because bleach in a powerful, chemical-based antibacterial cleaning agent, you need to be careful that you don’t use bleach for every cleaning chore around the house. Borax is a safe alternative to bleach that is septic friendly, but still a powerful cleaner. Similarly, products containing ammonia, as well as pure ammonia, are safe for septic use in moderation. Used properly, ammonia won’t kill the bacteria in your septic system, but in excess, ammonia will offset the bacterial balance of your septic system. Products which are absolutely blacklisted from use with your septic system are drain cleaners, like Drano and Liquid Plumber. As some of the most corrosive chemicals found in the house, a key ingredient in these products is sodium hydroxide, or lye. Some even contain sulfuric acid or hydrochloric acid. A much safer, and more effective, method for cleaning plumbing clogs is to snake the effected drains. What “Natural” Household Cleaners Can I Use with my Septic System? Some great alternatives to the chemically-laden household cleaners are all-natural products found around your home. Due to its naturally acidic qualities, lemon juice is a miracle cleaner. A natural disinfectant, you can use it to clean countertops, toilet bowls, sinks and appliances. Similarly, vinegar is a wonderful household cleaner. It can be used as a stain lifter from tile or porcelain, it will cut through hard water stains or soap scum on your shower door, and it will eliminate unpleasant odors from your dishwasher and washing machine. Another favorite natural household cleaning agent of ours is baking soda. As one of the safest cleaners to use with septic systems, it can be used to both clean and deodorize your home. Just sprinkle on countertops, in sinks, or into the toilet bowl and scrub. Coupled with regularly maintenance, being careful about what you put down your drains, even by making careful choices about the household cleaners you use, will help prolong the life of your septic system. Do you have questions regarding your septic system. CONTACT US today!